Do you have random balls of yarn in your stash that you have no idea what to do with? Or do you have leftovers that you don’t want to throw away, but don’t know what to do with either? This pouf pattern is perfect for all leftovers and odd balls of yarn. No matter what colors you use, it always looks amazing. I made this pouf using a lot of random yarn, different brands, materials and weights. Doesn’t matter what you use; the stranger the combination the more unique the end result. To make a very short summary, you will need lots of yarn to make this pouf, especially because you need to use your yarn double stranded. I used something like 4000 meter to make mine. In my pouf I have mostly acrylic yarn, but there is also a bit of wool and cotton in there. Yarns I used include Stylecraft Special DK left over from the Dutch CAL 2015, DMC Tapestry embroidery wool that was left over from a large project, and Scheepjes Stonewashed XL left over from designing Stephan and Vincent squares. In addition to the yarn you will need a 3.5mm hook and lots of pillow stuffing. I used two old duvets to stuff my pouf. You can use any and as many colors as you like. You can also use your colors in any way you think looks nice. I often used two different colors of yarn in one round. When I ran out of one color I simply joined another in its place; also if it was mid round. This gives a very playful look to the pouf. For the most striking effect, use a different color each round. The final size of your pouf depends on how large you decide to make it. Mine is approximately 60cm in diameter and 40cm high. You can however easily make it larger or smaller if you wish. Please note that US Crochet Terminology is used for this pattern. If you are more familiar with UK terms, please use this conversion chart as needed. It is important to have a dense fabric for the pouf to keep the filling in and to make it more durable for use around the house. For this reason use a much smaller hook than recommended for the yarn. If you use worsted weight yarn you can use this as a single strand, but if you use double knit yarn use this double stranded. Sport or baby weight yarn is best used triple stranded. I used mostly double knit yarn double stranded with a 3.5mm hook. Work away yarn tails by working over them as you go. Otherwise it will be a lot of work to weave them all in. Additionally, as you close your pouf it gets hard to reach them. Don’t leave you ends dangling on the inside of your pouf as they could easily come undone during use. Work the pouf in 3 distinct stages; first make the top circle of the pouf (TC rounds), then the sides (S rounds) and finally the bottom circle (BC rounds). In the first part of the pattern increase the diameter of the pouf till the right size is obtained. Continue repeating round TC4, increasing each round with 6 stitches, until you have the desired outer diameter of your pouf. I made 60 rounds, but you can easily do more or less rounds. Your pouf will look something like this at a certain point. In this part the diameter of the pouf is kept constant and the height of the pouf is made. Leave the stitch markers in position in the last round worked and work over them. When we start decreasing the diameter again we will come back to the stitch markers. Repeat round S1 till the pouf has the desired height. I did 50 rounds. In this part of the pattern the diameter of the pouf is decreased back to 6 stitches. Each round 6 stitches are reduced. Bring the stitch markers from the last TC round to the equivalent position in the last S round just worked. Continue repeating round BC1, decreasing each round with 6 stitches. At a certain point your pouf will start to look like this. Then continue even further till you have an opening of about 10cm. When you have an opening of about 10cm stuff your pouf. This is a lot of work and needs to be done with care. Be sure to spread the stuffing evenly and compact it really well. When you think you can’t possibly stuff any more in there, stuff some more. It is the only way to make sure that your pouf is sturdy enough to sit on. I used an old duvet to stuff my pouf. I cut the duvet open and pulled the fibers out of the duvet and into the pouf. The fabric lining of the duvet I threw out. By using only the fiber filling and not the entire duvet you have much more control of how you stuff your pouf. Again, continue repeating round BC1, decreasing each round with 6 stitches until there are 6 stitches left. Close this last part with a thread and needle. Take real good care to close it good and tight. With all the stuffing in there it is going to be hard work, trust me. Work away your last yarn tail. And then you are all done! A tip for later; you will notice that as you use your pouf the filling becomes more compact, which in turn can lead to dents in your pouf. If the dents are too deep, cut open the last 4 or 5 rounds on the bottom of your pouf, stuff more filling in and pay extra attention to filling up the dents. Close your pouf again by working the last few rounds of the pattern with new yarn. This should fix the problem. This pouf is a serious part of my home decor. My boys use it for everything from sitting on when watching TV to using it as a bat to hit each other with. Boys will be boys…. Nonetheless, it is a great project to use up scrap yarn and I really like how it came out. Feel free to share your hand-made stripey pouf on my Facebook page or tag me into one of your posts on Facebook or Instagram. (C) Copyright It’s all in a Nutshell. All rights reserved. This pattern is available for unlimited personal use. You may print a copy of the pattern or keep a digital copy for personal use only. Do not reproduce or sell my patterns (either digitally or in print). Do not post my patterns online, either as a complete document or in part. Please refer to back to this pattern by linking to it from your blog or website. You may sell items that you make with as long as you credit me as the designer. To shop owners and yarn sellers : it is not allowed to make kits without my permission. Please do not print copies to distribute with yarn sales as this is an infringement of copyright. There is a ‘print & pdf’ button at the bottom of the post, before the comments. You can then print or save the post. Looks like fun. I think I will make it. Thanks. Looks like a fun project. Did you use polyester fiber fill? I love this idea. 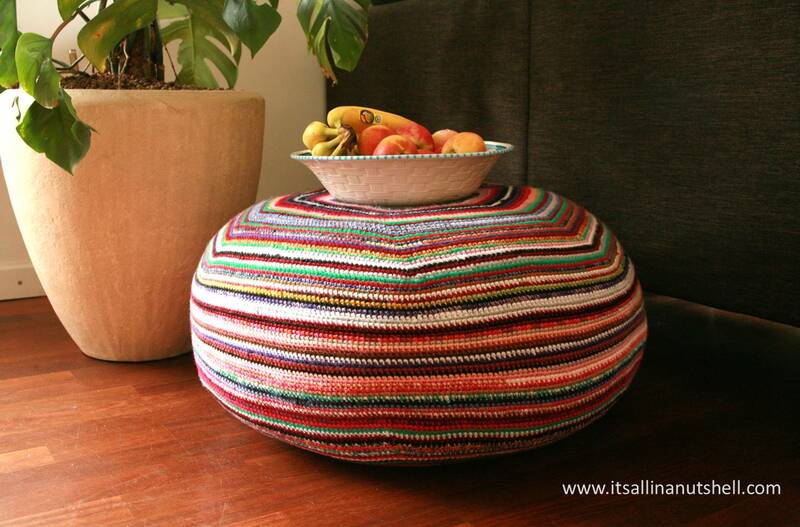 I guess you could also crochet round an existing pouffe to avoid all the stuffing. Mind you, I don’t actually have an existing pouffe! I love this project but I’m just getting back to crochet. I’ve always just made afghans. Is this a difficult project? Definitely for the very near future! I will not be doing a video tutorial for this pattern. It is just too big to do under the camera. If you follow the instructions you should be ok. It is all single crochet stitches, with in the beginning increases and at the end decreases. Hi Esther, great idea!! I began my pouf according to your instructions but by increasing the top circle my circle started to make waves. Never had this problem with single-stranded yarn, but only with double-stranded. Do you have any advise what I can do to avoid that? I have never had this before…. possibly you crochet thighter than me. You could go up a hook size and see if it helps? I was getting edgy as I was disappearing under a huge amount of surplus yarn from the projects I’ve done this year. I should be sorting out Christmas cooking but I’ve started this instead. Hi, I would love to do this project. I am going to America next week and wanted to pick up some of the Caron Cakes ( variegated and I believe worsted weight yarn ) could you tell me whether this would be suitable and also how much yarn I would need. Many thanks. Sure, any yarn is suitable so caron cakes will be also. I cannot tell you how much yarn you will need because this is a leftover project and I did not keep track of yarn amounts. That is the best part of the pouf, you can mix yarns and use up stray balls. Thank you. In your comments at the start of the project you say that you will need around 4000 metres if using double knit because it’s used double stranded and 2000 metres for worsted because you can use it single stranded. As Caron Cakes are light worsted, whatever that means, do you think 2000 will be enough. Thank you. Hi, I am definitely going to make this at some point soon. Can I ask – are the stitch markers in the places where you have added the extra stitches? Thanks.